Christmas favorites, a set on Flickr. Washi tape candle holder, a photo by jmcraftygal on Flickr. A quick and easy decoration using a straight sided glass, washi tape, velum, snowflake ribbon and a battery operated tea light. Points and Angel Card, a photo by jmcraftygal on Flickr. Stamps used Quietfire Design sentiment from new home set # 5924 and Poinsettia and leaf from Stampin Up! Joyful Christmas set. Sharing our snow by way of photo! 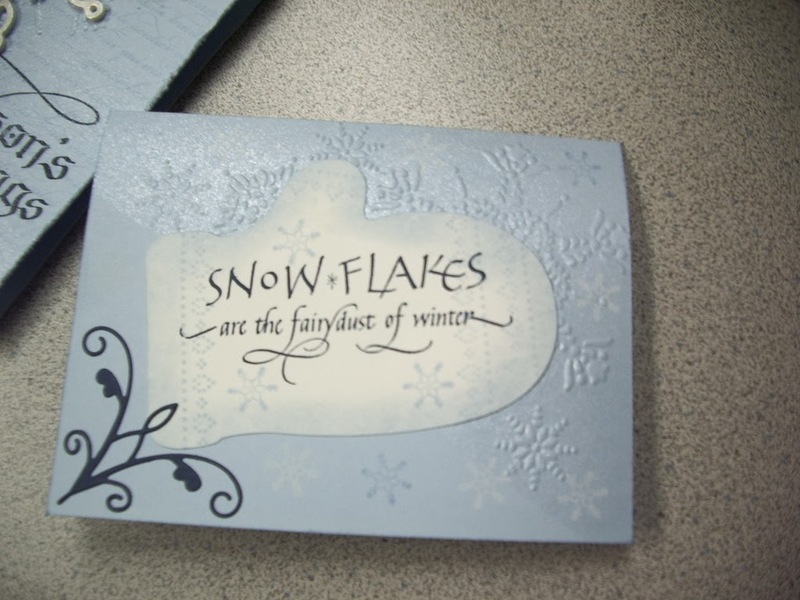 Both cards are stamped using Quietfire Design Stamps. A favorite of mine from last season. The sentiment is from Quietfire Design. Oh Christmas tree ATC - for trade, a photo by jmcraftygal on Flickr. Snowball fight ATC - for trade, a photo by jmcraftygal on Flickr. Christmas Memories Card, a photo by jmcraftygal on Flickr. I embossed this card using the Memory Box Die - Glowing Candles. The Sentiment is one of the many beautiful Calligraphy Stamps available at Quietfire Designs. Entered in Craftyhazelnut's Christmas Challenge anything goes for December. Stocking Trio Card, a photo by jmcraftygal on Flickr. For this whimsical card I used the sweet Stocking image from the Color Me Christmas stamp set and the sentiment is from the Sassy Salutations stamp set. Both from Stampin Up! The ribbon strips are made from card stock using the faux suede technique. Joyful Christmas Card, a photo by jmcraftygal on Flickr. For this card I used the Dynamic Duo DD # 82 colour scheme, Primrose petals and Gumball green. I really like how the two colours work together. Stampin Up! Joyful Christmas Stamps, Card stock, Markers, Ribbon and Pearls. Something Special Greeting, a photo by jmcraftygal on Flickr. I just love the new Seasonal Sentiments from Suzanne at Quietfire Design! Deer Christmas Card, a photo by jmcraftygal on Flickr. Today, Dec 6, is St. Nicklaus Day, a day that I remember fondly from my childhood. My brother and I would set our boots outside of our bedroom doors the night of the fifth. And in the morning we would find a small gift in them. Sometime a small toy or some fruit or chocolates. Wishing every one a Happy Crafty Holiday! Ornament #1 2013, a photo by jmcraftygal on Flickr. This pretty ornament is made of Stampin Up! supplies including the largest festive flurries die also the ornament and mosaic punches. It measures 11" so it's perfect for on a tree or as a hang alone in a window. It will also fold flat for shipping.